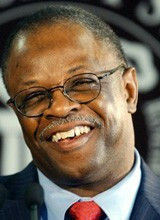 Sylvester Croom was born September 25, 1954 and was the former football head coach at Mississippi State University and current running backs coach of the St. Louis Rams. He was the first African American head football coach in the Southeastern Conference. His father, Sylvester Croom, Sr., was himself an All-American football player at Alabama A&M, later the team chaplain at the University of Alabama, and has been recognized posthumously by that school as one of the state's 40 pioneers of civil rights. On November 29, 2008, one day after his team was beaten 45-0 in the Egg Bowl to rivals Ole Miss, he announced his resignation as head coach of Mississippi State's football team. Successful coaches such as a Sylvester Croom have led their teams to numerous victories and do what it takes to motivate. The booking agents at AthletePromotions can assist with Sylvester Croom speaking engagements or corporate appearances. We have years of experience in booking coaching keynote speeches and autograph signings. Booking a coach like Sylvester Croom is a very easy process. Our agents can provide availability, fees and all costs associated in bringing out a successful coach star to your next corporate event. We can easily find Sylvester Crooms agent to make this appearance happen. A Sylvester Croom appearance will add the great speech to your upcoming event, rewarding employees, clients and customers. Most likely, fans and corporations can find Sylvester Croom's official website, charity involvement, Twitter account, representation, publicist and management info at www.Sylvester Croom.com.